You can't check all of these yourself, but you can check the simple ones like lights, tyres etc. 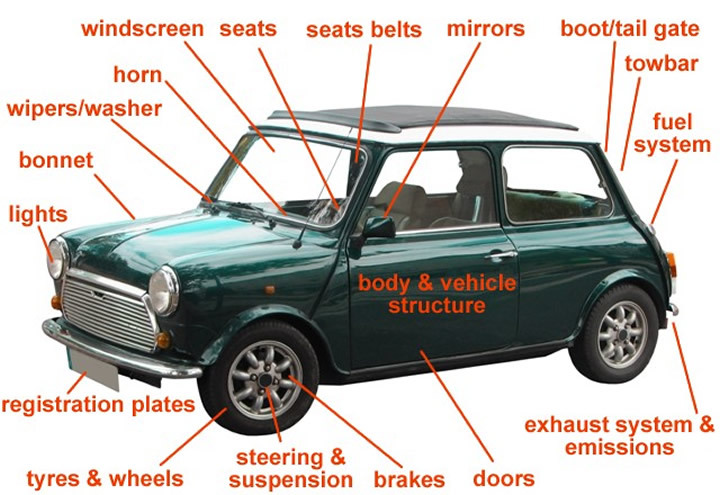 The body and vehicle structure- Is free from excessive corrosion or damage in specific areas and there are no sharp edges likely to cause injury. The fuel System- Has no leaks and the fuel cap fastens and seals securely. The fuel cap will need to be opened so be sure the key is available. The exhaust emissions- The vehicle meets the requirements for exhaust emissions, dependant on the age and fuel type of the vehicle. The exhaust system - Is secure, complete, without serious leaks and silences effectively. The brakes - Their condition, operation and performance (efficiency test). Note the removal of the road wheels is not part of the test. The horn - Operates correctly and is of a suitable type. The steering and suspension - Are of a satisfactory condition and operation. Tow bar- All components will fail if insecure, fractured or excessively worn, corroded or damaged. The vehicle identification number (VIN)- Is on vehicles first used on or after 1 August 1980. Not more than one different VIN is displayed except on multistage build vehicles. Information courtesy of Vehicle and Operator Services Agency (VOSA).